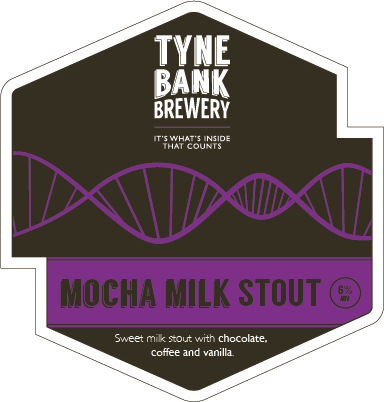 Tyne Bank Brewery: Mocha Milk Stout Brewday. Today we brewed one of our favourite beers. Mocha Milk Stout is a big beer, one of the strongest we brew, and boasts the highest amount of ingredients of any of our ales. This 6% stout uses a complex malt bill with a blend of the finest dark malts, and is flavoured with Brazilian Coffee. The coffee we use was selected and roasted by Pumphreys of Newcastle, who's history can be traced back to the year 1750. With so many years of experience they were able to select the perfect coffee for Mocha Milk Stout. But a mocha isn't just about coffee, we use 100% pure cocoa powder to provide a rich, chocolate character which is balanced perfectly with the coffee. But why is called a 'Milk Stout'? The addition of a non-fermenting lactose sugar to the beer gives a silky sweet taste which enhances the chocolate notes, and compliments the light bitterness from the coffee. Finally, the addition of whole vanilla pods late in the process adds an extra level of flavour. The best way to get the flavour of the coffee in, without clogging up the brew kit, is in tights! Looks strange I know, but it works! The tights of coffee are left in the underback for a few minutes each to get the perfect amount of flavour out. Adam having fun playing with hosiery. Mocha Milk Stout will be available in cask from the 21st of July, and in keg a few weeks after. We currently have some bottles in stock, so come down to the brewery shop and grab some, only £2.50 each. Dark beers aren't just for winter.